Glen Innes Holy Trinity Church Vicar Reverend David Robinson, left, Parish council member Jan Sharman, Northern Tablelands MP Adam Marshall and John Page celebrate the $45,000 grant to replace the historic church roof. 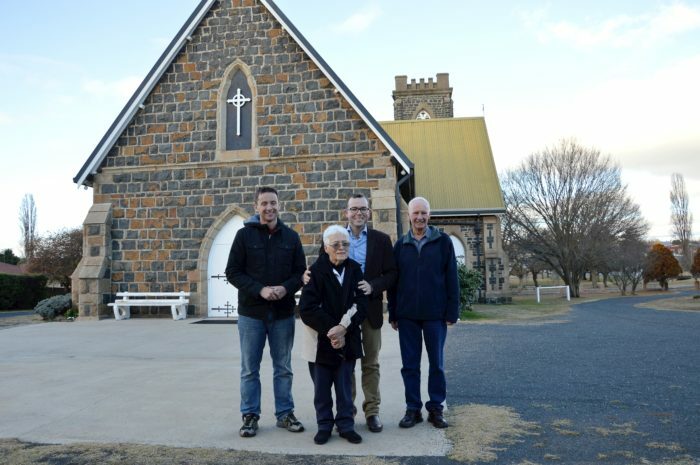 A NSW Government heritage grant of $45,000 will really raise the roof of the iconic Holy Trinity Anglican Church at Glen Innes, with some ‘divine’ help from local State MP Adam Marshall. The historic church building is set for a born-again roof to plug the leaks of the old one, installed nearly 50 years ago. Mr Marshall said the funding would repair the roof’s under structure of beams and battens in the sarking and allow for the installation of a new water proofing membrane and building materials to stop any leaks. “Holy Trinity is one of the oldest churches in Glen Innes, which has a rich heritage of architecture in local places of worship, so it’s really a religious rite that we have to preserve that heritage and that beautiful building landscape,” Mr Marshall said. The funding will allow for that modern renovation – but still reinstate the old. “The plan is to reinstate the old iron roof and by reusing it preserve the historical integrity of it so the building still tells its heritage story,” Mr Marshall said. Former long serving assistant minister John Page is the designated project manager for the roof repair project but comes with some pretty impressive earthly qualifications for the job. “John still helps out with weddings, funerals and baptisms as a sort-of retired-without-pay cleric, but he’s also a qualified engineer so this new ordained role is in step with his calling,” Mr Marshall said. Mr Page described the grant funding as ‘marvellous’ and was the culmination of a two-year campaign. “But it’s been worth the wait – although we will have to wait ‘til the windy weather and the frosts are over but by the end of September I think we will be ready to start the work,” Mr Page said. The roof area is quite extensive and they’re hoping the timber rot is not too extensive that it disrupts the timeline plans. Mr Page, who is still a warden of the local parish council, paid tribute to Mr Marshall for his work and support of the grant project, and also acknowledged the great help of local environmental scientist Patric Millar in their submission for funding. Mr Marshall said the funding came through the NSW Government’s Heritage Near Me Local Strategic Project program which worked to support communities to protect their local heritage assets.